The beginning of this April there was a very large scale dispersion sale of the Hairpin Cavvy belonging to Jim Leachman. It consisted of roughly 800 horses: brood mares, herd studs, fillies, young studs and whatever yearlings and babies hadn’t been weaned. 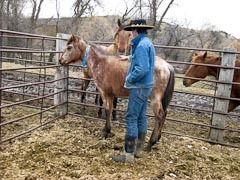 The herd was running on the ranch that Mr. Leachman owned near Billings, Montana, but when the ranch was sold by the state because of Mr. Leachman’s financial problems, the horses weren’t legally supposed to be there anymore. After a few months of disputes, lawsuits and disagreements, the Crow Tribe confiscated the horses on the grounds of trespassing on Tribal lands and organized a dispersion sale. This was good news to all of us guys that wanted to somehow obtain one of the Hairpin horses, cause they’re good solid ranch horses and we figured we’d get to pick out one or two pretty cheap…in the end it turned out just a little differently! Friday morning was the preview, the Tribe opened up the feedlot where the horses were being held so people could walk through and look the different bunches over. 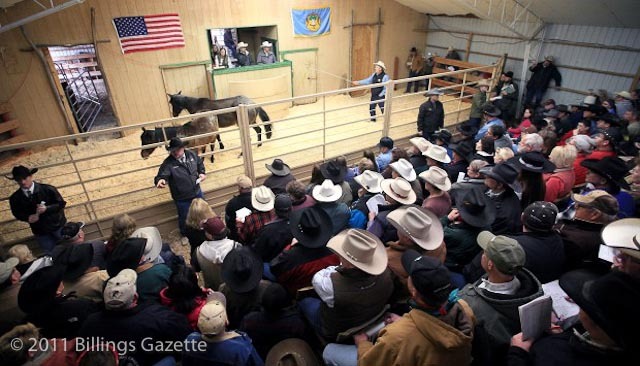 The sale started early Saturday morning in the very small auction ring in the barn there at the ranch. As many people as possible crowded in and the unfortunates (me and my friends among them) had to squeeze in close as possible to hear what we could. My cousins and I eventually found an upper level loft that we could climb up to and sit on… even though it wasn’t meant to be sat on ha ha. I had big plans of buying a young stud colt for a grade ranch horse to resell someday, but all of the two or three year olds were bringing more than I had to spend unfortunately. Friday ended with me going home empty handed but I was determined not to be the next day. Bright and early Saturday morning I hauled over there excited for the sale once again. I got in the sale ring before anybody else and parked my cousin there on two seats while I looked over the other 400 horses to sell that day. I picked out the ones I liked and wrote down their tag numbers. All through the day I was bidding on different colts, trying to pick something up but never having any luck. Finally that afternoon I managed to win a bay roan yearling stud colt that I liked, which made me feel pretty darn accomplished! After the sale was over, everybody that planned on loading out that day lined up on the road to get their horses, me included. As it turned out, we all had to come back the next morning to get them anyway, which wasn’t too bad I suppose, considering the number of people and horses needing to be organized. Overall, it was a fun sale to attend and I’m glad I went and could get me a pony that’s a color I’ve been after for quite some time! Aleena M. on May 12, 2011 He looks pretty nice Jake. Can’t wait to see him sometime!